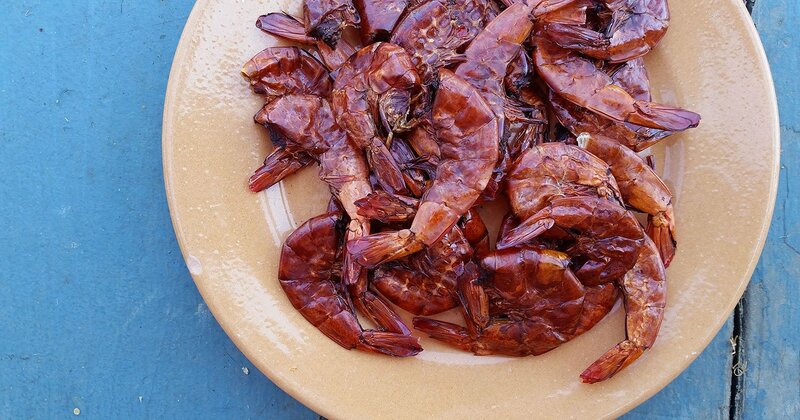 To many Americans, dried shrimp sounds more like fish food than something you’d want to eat. But we are in the minority, it seems. Sun-dried, smoked-and-dried or otherwise desiccated shrimp are a staple in many of the warmer places on this earth. You will see them a lot in Southeast Asian cooking, in China, India, Mexico — there they are the key ingredient in Christmastime romeritos, little meatballs served with seepweed — as well as in Brazil and West Africa. Interestingly, you can even get dried shrimp in Louisiana convenience stores, if you know where to look. West Africa is how I learned about dried shrimp. Some of you may recall that for a time I was a student of all things Africa (I earned Master’s degree in African History), and spent some time there in the 1990s. I didn’t see many dried shrimp outside of coastal Kenya, but when I returned I got to know some Senegalese guys, who swore by them as their secret ingredient. A little bit, ground up, adds a punch of salty umami. Too much and things get fishy-fishy. Their dried shrimp were always medium-sized and smoked. I liked that double hit of salt plus smoke. It’s a seafood equivalent of dropping a ham hock in greens or beans. Doing some research, I find that most cultures’ preferred dried shrimp are tiny and sun-dried. So if you prefer, skip the smoking step. Why make dried shrimp at all? Why not buy them? After all, there’s a big jar of them on the counter at my local Mexican carniceria. It was a happy accident, to be honest. I’d brought home a big freezer bag of shrimp from Alabama that I’d caught with my friend Joe Baya, who runs the magazine Great Days Outdoors. And once shrimp thaw, you need to eat them. So I made a batch of gumbo, a pot of Low Country perloo, and some pickled shrimp. That left only a few shrimp left. As it happened, I’d also caught a bunch of trout in the Sierra foothills, which I was planning on smoking… [light bulb goes off over my head] I know! Just add the shrimp to the brine! So into the smoker they went. I’d planned on eating them as-is, but the shells all stuck to the shrimp. Rats. But I remembered that dried shrimp are always used shell on, so I decided to just dry them out and use them like my old friends from Senegal would. They came out great. How to use dried shrimp? Typically these would be either reconstituted and served in a stew, or ground up and used as a condiment; I’ve heard a few Cajuns say it’s their secret ingredient in gumbo. The Senegalese tend to chop them up and put them in dishes like thieboudienne, which is arguably their national dish. 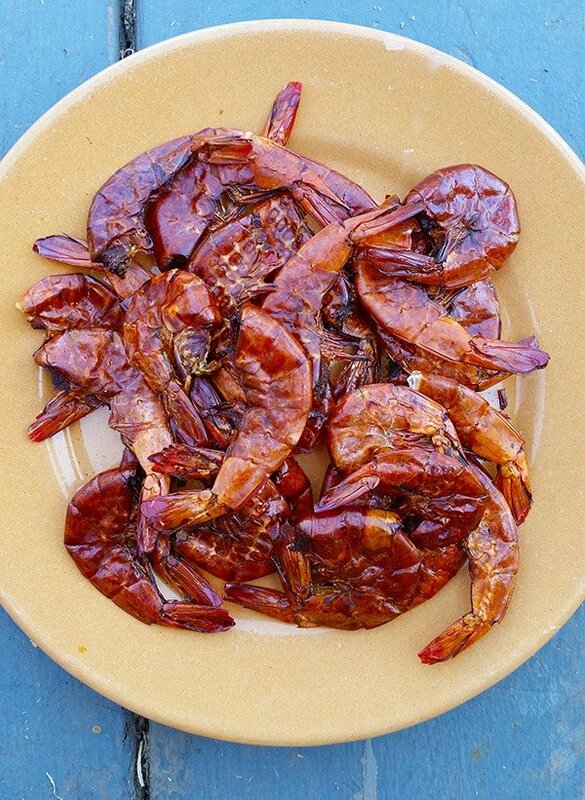 Dried shrimp are a common ingredient in Thai curries, and they are an ingredient in Chinese XO sauce. The Koreans stir-fry them. But you can just sit there and eat your dried shrimp, if you’d like. 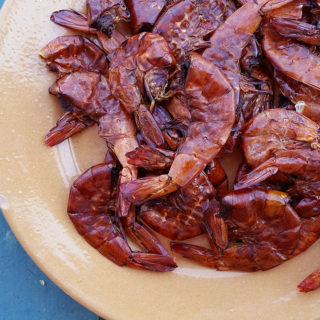 The shells are not worrisome at all, and the shrimp taste a bit like shrimpy, smoky potato chips. .
Any shrimp you can find will work, but most dried shrimp traditions use small shrimp: Since you use them shell and all, it’s a great use for the little ones. , or cannibalize them from other packages that used them. You can of course skip the smoking step if you feel like it, but I think it adds another layer of flavor. Any shrimp will work here, but I used Gulf shrimp. Mix the salt with a quart of water until the salt dissolves. Submerge the shrimp in this brine for at least 4 hours, and overnight is better. If you want to smoke your shrimp, lay them out in your smoker in one layer. Smoke over the wood of your choice -- I prefer alder or oak -- for 2 hours. Keep the smoker fairly cool, about 180 degrees Fahrenheit. Now it's time to dry your shrimp. You can dry them in the hot sun if you live in a hot, dry place. Or in an oven set on its lowest setting. I use a dehydrator. I start it at 135 degrees Fahrenheit, then after an hour or so, drop it to about 110 degrees. The shrimp are done when the snap in half cleanly. Let them cool to room temperature and pack into a glass jar. I add a silica pack desiccant to prevent any unwanted moisture from building up. They should keep this way a year. Note that prep time doesn't include brine time, and cook time doesn't include drying time. Hung: I don’t dry and salt small fish, only large ones like cod and bass, for European salt cod.